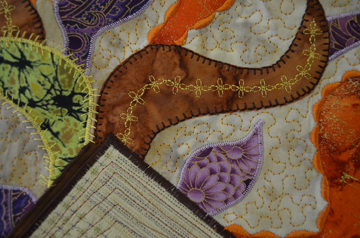 Explorations in Quilting and Life: Finished! Here is my finished piece, Outside the Box. 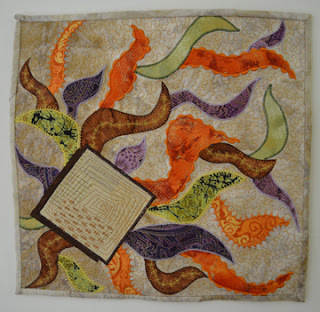 I strongly suspect this will be my donation for the 2012 SAQA auction as it is a 12" square. I had a good deal of fun playing with various stitches to embellish my sketch. You may remember, the idea came from my appreciation of the importance of getting 'outside of our boxes' by traveling, stretching ourselves. It is then that creativity flourishes.